The 19th century saw a wave of technological changes completely change military practice. And though the Austrian army would suffer for failing to adopt the breech-loading rifle in time, it had its own share of cutting-edge weaponry, including rocket artillery. In September 1807, the British Army lobbed about 300 Congreve rockets into the city of Copenhagen in Denmark, with the intent of setting both the city's residential areas and the Danish fleet on fire. About three-quarters of the city was destroyed, and 2,000 civilians killed. The weapons impressed the Danes, who quickly established a rocket corps of their own. Austria followed suit, and tested rockets in 1808 even before the Danes had their weapon ready. But the Austrian rockets did not impress the army commander, Archduke Charles, who suggested the rocketeers study the English weapons. Though Austria and Britain were allied, the British offered very little cooperation. Balked at obtaining British secrets, the Austrians sent engineer Vincenz Augustin to Denmark in the spring of 1815 on a secret mission while foreign minister Klemens Metternich quietly offered the Danes political aid in the upcoming Congress of Vienna in exchange for their rocket knowledge. The Danes agreed, but their eccentric rocket designer, Andreas Schumacher, would only brief Augustin verbally and refused to hand over any drawings. Weapons of mass destruction. 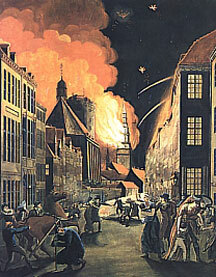 British rockets ignite Copenhagen in this painting by Christoffer Wilhelm Eckersberg. Assuring Metternich that he had obtained what he needed, Augustin established a rocket depot at the Austrian army arsenal in Wiener Neustadt and within two months he had equipped a rocket battery with 2,400 projectiles and their own very stylish dark-green uniforms. The battery marched to war during the Hundred Days campaign of 1815, participating in the siege of Hunigue that summer. The rocket corps expanded over the decades that followed, with Augustin overseeing continual improvements in their weapons. Rocket batteries served in the 1821 campaign in Naples, and alongside the Austrian Navy in its actions against pirates in Morocco and Syria. But it was the 1848-49 campaigns against the Italian states and Hungarian rebels that the rocket men made their mark. Rocket batteries fought in Radetzky's army in several field engagements, but the wily old marshal found them particularly useful in the bombardment of Venice. With Radetzky's seal of approval, Augustin received orders to expand his corps even more. The Austrian army re-organized into fifteen corps, each based on a geographical district and having a standard organization. Each corps was to have its own dedicated rocket battery, plus three more for the general reserve. The 4,000-man Rocketeer Regiment, as it was styled, dwarfed the rocket establishments of all other nations combined. Augustin received a noble title, and was considered the empire's foremost expert on weapons technology. He designed the 1841-model percussion musket that Austrian armies carried until 1857, and chaired the committee that selected the Lorenz rifled musket that replaced it. At those hearings, Augustin's firm opposition to breech-loading rifles kept those vital weapons out of Austrian hands in the wars that followed his death in early 1859. Russian, Austrian and French rockets of the 1850s. Rocket manufacture took place in secret, within the Wiener Neustadt arsenal. Finished rockets were exported to Switzerland, Sweden, Bavaria and Wurttemburg and had a good reputation for quality. Two types of rockets were furnished: "field" rockets for battlefield use, and "siege" rockets for targeting fortresses. Field rockets came in two calibers, 1.9-inch and 2.3-inch. Siege rockets were labeled by weight, with six-pound, 12-pound, 16-pound and 28-pound models including high explosive, shrapnel and incendiary warheads. 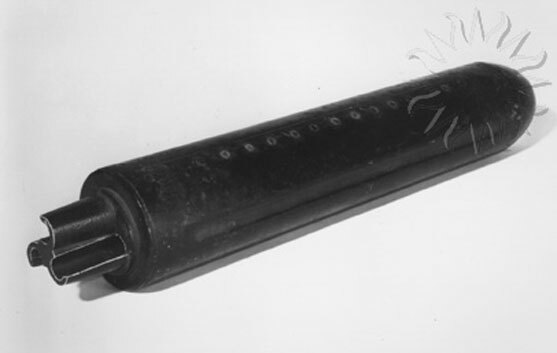 For the first four decades of their existence, the rocket batteries deployed "stick" rockets like those developed by the British. A long stick attached to the rocket provided stability in flight, but even so the weapon could at times veer wildly off course. This was not necessarily a bad thing, as the rocket's unpredictable flight added to its value as a terror weapon. In 1858, the English inventor William Hale demonstrated his spin-stabilized stickless rocket to the Austrian rocketeers. After several successful tests, the Austrians bought a license to manufacture them, plus several of his revolutionary hydraulic presses to help make them. The stickless rocket was laid in a tray, just like the stick version, and ignited. Special fins directed the gas exhaust to make the projectile rotate, and impart accuracy just like a rifle bullet or artillery round achieved with a grooved barrel. 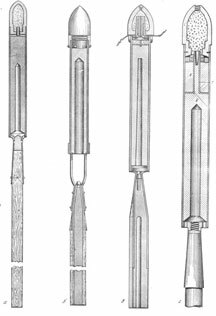 The rocket batteries that went to war against the French in 1859 carried both kinds of rockets, but afterwards the stick rockets were retired in favor of the more accurate Hale models. After the 1859 war, the Austrian army conducted a wide-ranging review of its failures and began a serious — and expensive — overhaul. The army's war strength actually dropped, as money went to re-equip the artillery with rifled cannon and many of the nearly useless reserve infantry formations were dropped from the rolls. The rocket regiment slipped from 18 to 12 batteries, but even then personnel began to be transferred to the regular artillery. In 1863, the rocket batteries were tabbed for conversion to mountain artillery, and began to receive excellent 3-pounder steel rifled mountain guns. By the time of the 1866 war most of them were mixed, with one section of two mountain guns and two rocket sections each with two launching tubes. But the new steel guns were proving themselves in exercises, and as the army could afford them they steadily replaced the rocket tubes. The rocket regiment even lost its unique designation in 1864; it remained as a testing, training and administrative center in Wiener Neustadt but its batteries were re-numbered as sub-units of the artillery. The men lost their unique uniforms and now drew pay and followed the promotion paths of the artillery branch. Only four rocket batteries went along with the field armies in 1866, though several more were deployed in Tirol against Garibaldi's Red Shirts. They saw some action in the initial battles in Bohemia and fought at Königgrätz, failing to distinguish themselves on the field while the artillery performed extremely well. The one battery assigned to Southern Army was not present at Custoza, and was re-equipped with captured Italian cannon immediately after the battle. Northern Army's three batteries (one each with I, II and IV Corps) appear to have lost their rocket tubes in the general re-organization of the artillery after Königgrätz, but the batteries assigned to fortress garrisons retained them until the end of the war. Rockets saw their last use under Austrian colors in 1869, when a small expedition went to southern Dalmatia to repress mountain tribes who had refused to register their firearms. The rockets helped overawe the rebels, though they seem to have caused no casualties. When the tubes returned to the arsenals afterwards, they remained there until scrapped later in the century. In Battles of 1866: Frontier Battles, rocket batteries move more quickly than conventional artillery but otherwise are treated in similar fashion. They lack the range and firepower of the standard Austrian artillery batteries with their new rifled guns, but will be more prominent and useful if we ever get around to the 1859 version of the game. 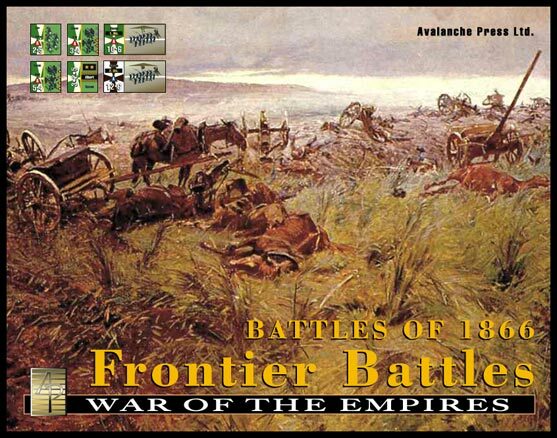 See the rockets' red glare for yourself in Frontier Battles — order now! Mike Bennighof is president of Avalanche Press and holds a doctorate in history from Emory University. A Fulbright Scholar and award-winning journalist, he has published over 100 books, games and articles on historical subjects. He lives in Birmingham, Alabama with his wife, three children and his dog, Leopold. Leopold fears rockets.